A couple of months ago, PB and I had some friends over for an American-themed dinner, starting with Cioppino, a San Franciscan fish stew. For the main event, I wanted to make baby back ribs (with sides of corn bread muffins and mac ‘n’ Cheese). Those sticky, sweet, melt off the bone kinda ribs, that I only order in restaurants when I’m feeling very decadent, and am in the mood to lick my fingers. Making them at home always seemed like quite a daunting task, and I didn’t know the first thing about cooking this cut of pork, let alone how to make a BBQ sauce. I was nervous about cooking it, and did a practice run during the week. Let’s just say that PB was taking some pretty sweet lunch boxes to work over those few days! Doubting that I could make my own sauce (don’t people spend years perfecting their recipes?! ), and not wanting to screw it up when I had 6 people over for dinner, I initially opted for (shock horror!) bottled sauce. The initial recipe also said that I should cook the ribs at 180 for 2 hours. Whilst the result was tasty, it wasn’t anywhere near falling off the bone, and the sauce was monodimensional. So I decided to throw caution to the wind and make my own sauce, and man was it worth the effort. 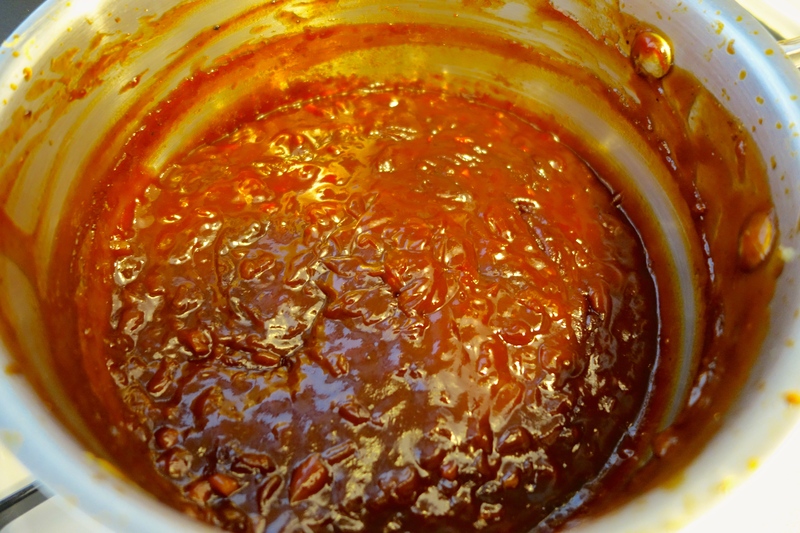 It didn’t actually take much effort at all, and it is a super easy BBQ sauce to make, simply plonk all the ingredients in a saucepan and stir! I also lowered the heat in the oven (for lack of a barbeque grill) and cooked those bad boys for as long as I could to try and achieve the tenderness that I needed. ♥ Preheat oven to 140°C/280°F. 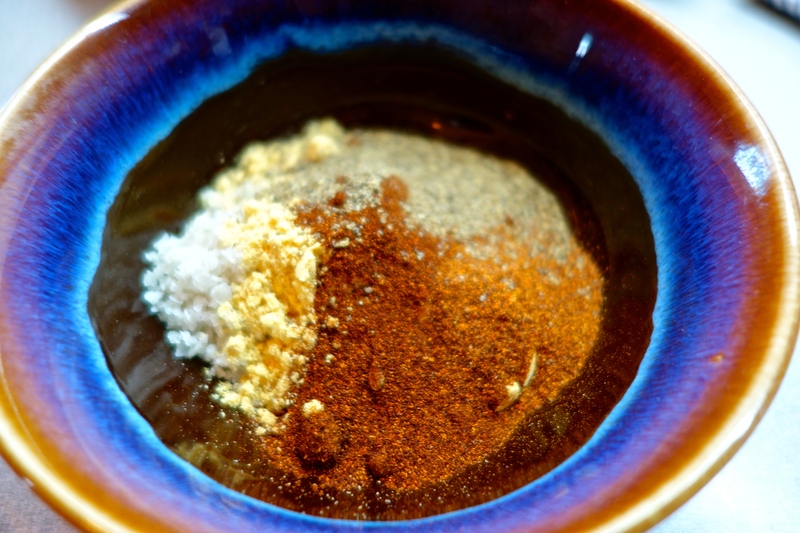 Combine first 5 ingredients in a small bowl to make the dry rub. Place each rack of ribs on a double layer of foil; sprinkle rub all over ribs and rub in. Wrap racks individually and divide between 2 baking sheets. ♥ Bake ribs until very tender but not falling apart, about 3-4 hours for baby back ribs, and longer if you are using spare ribs. The longer the better! 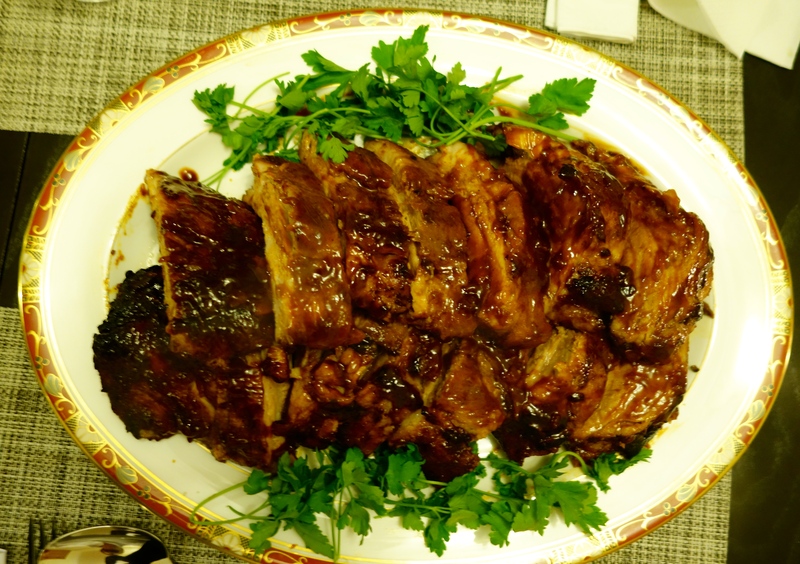 ♥ Carefully unwrap ribs; reserve the juices to later add to the BBQ sauce. Let ribs cool completely. DO AHEAD: Ribs can be baked 1-2 days ahead (the flavor will be more developed, and the cold ribs will hold together better on the grill as they heat through). Cover and chill juices. Rewrap ribs in foil and chill. 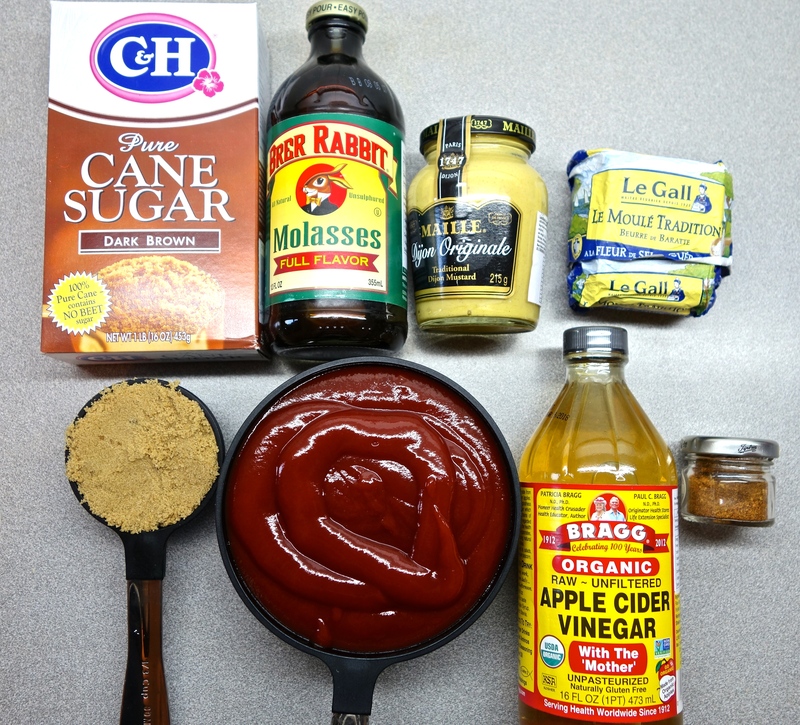 ♥ Make your BBQ sauce with the recipe below. Once sauce is complete, take rib juices out of the fridge, skim off the layer of fat, and stir into your BBQ sauce. 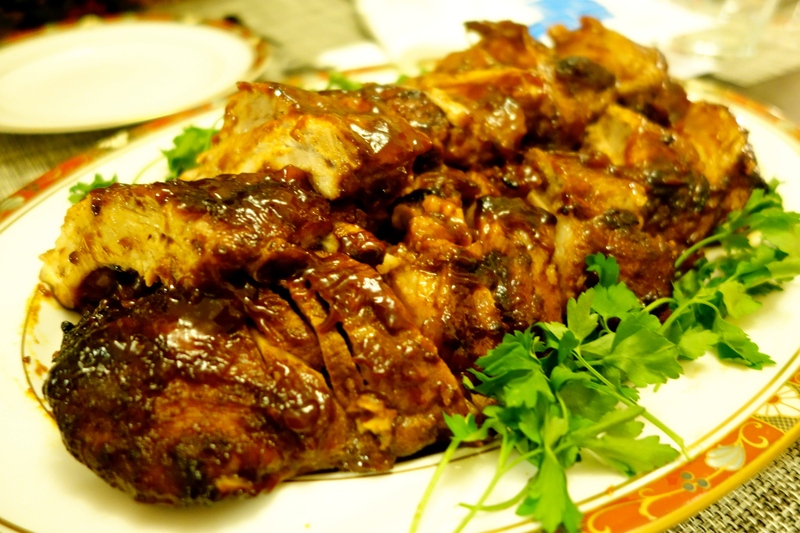 ♥ Grill ribs, basting with barbecue sauce mixture and turning frequently, until lacquered and charred in places and heated through. Transfer to a cutting board; cut between ribs to separate. Transfer to a platter and serve with additional barbecue sauce. Now, as a disclaimer, I wouldn’t say that these are the best ribs on the planet – far from it. Whilst I thought my sauce was pretty awesome, the meat was still clinging to the bone, and the ribs have some improvement to do before I would say it was close to the level of ribtasticness that I am aiming for – that of Naughty Nuri’s ribs (some of the best ribs I’ve tasted). Ribs are one of those meals that might take a person a lifetime to perfect, like the perfect burger, or the perfect soufflé. Somewhere in Kansas City, there is a little ol’ lady who has been makin’ ribs all her life and after 50 years has finally got it right – I wish I was her friend. But alas, I am not. So it might take me a few more tries, but this is a good place to start! love bbq! im sure my BF will enjoy this recipe! damn delicious, finger licking good!! !